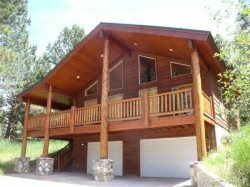 McCall Idaho Vacation Rentals | Mountain Meadow Retreat | 5 minutes from downtown | Ponderosa Park | Golf and bike path | ski, swim boat on Payette Lake | Trophy fishing. Welcome to Mountain Meadow Retreat. Lovely meadow views with abundant wildlife. Mountain Meadow Retreat misty morning. Comfortable, comtemporary furnishings. Bright, open living space. A Cook`s paradise. Spacious and beautifully equipped kitchen. Work space and counter seating for additional guests. Vaulted ceilings with fans. Patio access from living area. Three private bedrooms located downstairs. Master Suite has a king bed. Attached, master bathroom. Master bathroom. Master Suite has patio access. Guest bedroom one has a queen bed. Hallway access, full sized bathroom. Guest bedroom two has a queen bed. Bright, open stairwell to second level. Bright sleeping loft. Loft bunk room has 3 twin over twin bunk sets. Loft bunk room has play area. Full size laundry. Stunning kitchen. Patio has table, chairs and umbrella. Propane fire pit and grill too. This family and pet-friendly home is located next to a major bike path, adjacent to a golf course and close to the center of McCall. Mountain Meadow Retreat comfortably accommodates 12 people in three downstairs bedrooms one with a King bed and two with a queen bed, three twin over twin bunks in the upstairs loft and 2 bathrooms. This lovely home is stocked with lots of games and entertainment for kids and adults alike. Open floor plan with patio access from Great Room and dining area. For those that love to cook, the beautifully equipped kitchen has a countertop water purifier and an efficient u-shape design for great meal prep workflow and countertop service space which doubles as counter dining for guests. Should you choose to dine al fresco and enjoy the abundant wildlife and meadow view, you’ll be comfortable around the outdoor dining table. During the evening, gather ‘round the propane fire pit and share a story. This home has a deep driveway for your rigs, sled deck or small boat trailer. A birder’s paradise, enjoy a 15-mintue walk to Payette lake through woods and quiet streets. Located just off Spring Mountain Ranch Blvd and less than 1 mile to the center of McCall for shopping and dining. Get in your walking and cycling time – a major path is just across the street and you are a few minutes drive to the McCall Golf Club and Restaurant. Golf any or all of the three, nine hole courses – Aspen, Birch and Cedar. Ponderosa State Park is one of our local gems and is just a few miles from your front door. Bring your bikes or rent one downtown. During the winter months A Nordic-ski wonderland is right outside the door. Don’t forget, you are a short drive to downtown and all of the fun festivities of Winter Carnival where afterwards, you can return to the peace and quiet of home base. Sledding enthusiasts are ten minutes from back country access. Fishermen are the same distance to Idaho Trophy Trout fly fishing at Little Payette Lake. Your worry free, DoneRight Management Vacation Rental, is equipped with linens, bath towels and essentials that include guest soaps, shampoo/conditioner and hair dryer as well as Kitchen essentials and towels. To start your vacation off right, we’ve provided a days worth of supplies including your morning coffee, paper towels, bathroom tissue and garbage bags. Also provided where required is propane for gas grills, and enough wood for fireplace use during your stay. For properties with a fire pit, you can purchase wood at several local stores. Our little guests are important too, most homes include a pack n’play, high chair, booster seat and baby gate. Please check the amenities sections for the property you’ve rented on our website as you may have to bring some of these items with you. See above. I am extremely satisfied with customer service. We had been renting a particular house for many years but it sold and no longer available. I was directed to a clearing house (InIdaho) which provided potential houses that met our needs. In all it was a very efficient and painless process to find a suitable house that met our needs. We called to add an extra day - at eh beginning o f our visit. They made that possible. The City of McCall surrounded by Mountains with the natural gem, Payette Lake, at their base allows vacationers countless opportunities to discover and explore the outdoors. Lake and river fishing, boating, downhill and Nordic skiing, snowmobiling, hiking, biking or soaking at one of several hot springs in the area bring our guests back year after year all year long. Savor an alpine summer sunset from your balcony, deck, patio or lakeside at Legacy Park.